← How to convert HTML to jpg? Have you ever found a such kind of application which can convert some kind of printable document to image format? If so, the application Document Converter will be a good answer to you. It is really a powerful document converter which has the ability to convert any printable documents to image formats, including webpage to pcd. It is also designed for meeting different purposes of different people because there are three applications in Document Converter. The three applications are the GUI application, command line application and virtual printer application. If you need to convert documents to images in batch, the GUI application is a good helper. If you want to develop software basing on Document Converter, the command line application may be the best choice. If you need to save paper and ink when you print document, please choose the virtual printer application. At the same time, the virtual printer application docPrint can also act as a document converter which has a clear interface. By using docPrint, you can convert webpage to pcd easily within three steps. Please download Document Converter at http://www.verypdf.com/artprint/docprint_pro_setup.exe if you want to use docPrint. Please open the Webpage and click “File”—“Print” for opening the “Print” dialog box. You can also use the hot key “Ctrl”+ “P” to open the “Print” dialog box. In “Print” dialog box, you are able to choose the current printer as “docPrint” in “Printer” combo box and click “OK” button to close this dialog box. Then you will see the docPrint main window on the screen. You can click “File” and click “Save as” in the dropdown list in the main window of docPrint. You can also use the hot key “Ctrl”+ “P” to open the “Save As” dialog box. The “Save File” button in the toolbar is also a good way to open the “Save As” dialog box. 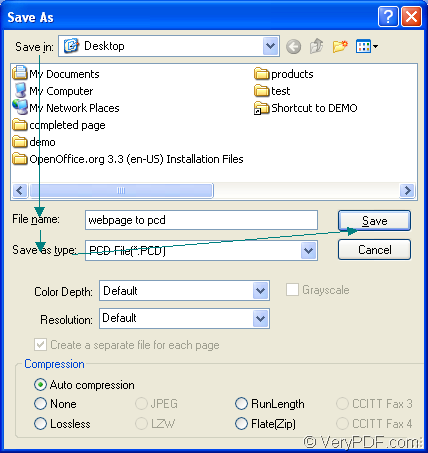 Please find a suitable location for the target file in “Save in” combo box. You should input the name for the target file in “File name” edit box. In “Save as type” combo box, please choose the right output format. You can see the “Save As” dialog box in Figure1. When the conversion from webpage to pcd is over, you can see the target file in the specified location and you can use some kind of image viewing program for checking the target file. How to print docx to postscript? Can I convert MSG file to PDF file from C# source code by docPrint Standard Version?